Wormwood 30 has just been announced, with essays on Algernon Blackwood, Ambrose Bierce, Caitlin Kiernan, Margaret Benson, Ada Goodrich Freer, George Macdonald and Sara Coleridge. 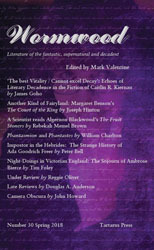 In this issue, William Charlton explores books by Sara Coleridge and George MacDonald that each deal in the world of fantasy, dream and fairy tale, and have certain apparent similarities: however, he argues that their differences are more significant. He also suggests that many of the dimensions they explore have still not been pursued by later writers, and there remains a rich seam within fairy lore yet to be mined. Fairy lore is also present in Joseph Hinton’s study of Margaret Benson, a neglected member of the family that gave us the ghost story writers A.C., E.F. and R.H. Benson. Though she only wrote one volume of mystical and supernatural stories, these are vivid and unusual explorations of ancient Egypt interpreted through the motifs and symbols of fairy tales. She was one of the first women archaeologists in Egypt, and fused her experience of the country and its antiquities with an individual spirituality to create fervent prose evocations of the unearthly. There is a fairy tale element also in Algernon Blackwood’s novel The Fruit Stoners, which has rarely received the attention given even to the better-known of his longer works, such as The Centaur. It has often been seen as an allegorical tale for children. But, argues Rebekah Memel Brown, it ought to be considered as one of his major works, a thoughtful meditation, informed by developments in science, on the nature of time and space. Accounts of Hebridean folklore, including fairy tales, appeared under the name of Ada Goodrich Freer, who also compiled a volume of supernatural stories. But, as Peter Bell relates, a great deal of the folklore work was taken from another, more diffident, hand, who has only fairly recently been given due credit. There are very modern and bizarre fairy forms among the altered humans of Caitlin R Kiernan’s work but, as James Goho describes, they are far from the genteel Victorian world of the children’s play-book. Her neo-Decadent fiction often involves extreme art and gruesome futuristic ‘atrocity exhibitions’, and echoes the original Decadents’ rejection of their society and its shams by depicting the outré outcasts of today. But, just as Decadence was one of the sources of Modernism, so Kiernan’s work is also characterised by experimentation with form and style. Few have ever written more sardonic and macabre stories than Ambrose Bierce, but as Tim Foley recounts, he once led a fairly carefree life on a long visit to England, which afterwards seemed to him a charmed time. If his restless spirit haunts anywhere, it emerges that it may not be Mexico, where he disappeared, but leafy Leamington Spa. We also offer our regular columns by Doug Anderson, John Howard and Reggie Oliver reviewing past and present fiction in the field of the fantastic. A question for which I haven't yet seen an answer, so far as I recall: is Kiernan's name pronounced (as American usage would have it) Kate Lynn, or is it Kathleen (as it'd have been in its aboriginal Ireland)?